As part of Biochemistry and Systems Biologyand the Chemical Biology and Bioinorganic Chemistry groups, we have rationally designed the heme active site of a thermostable cytochrome P450 CYP175A1 was to increase the peroxidase activity. The crystal structure of CYP175A1 shows absence of suitable amino-acid residues in the distal heme pocket that could act as acid-base catalysts as in the heme peroxidases such as HRP and CPO. The aim of the present project was to modify the active site of this thermostable P450 to introduce a residue at the distal heme pocket that could act as an acid-base catalyst and thus enhance the peroxidase activity in the mutant enzyme. This could potentially lead to the creation of a thermally stable artificial peroxidase. 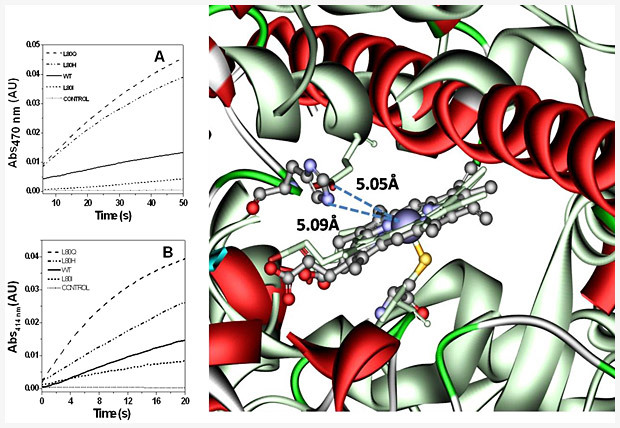 In this project we have carried out molecular modeling studies and identified that the Leu80 residue in the CYP175A1 could be suitably mutated to enhance the peroxidase activity of the mutant enzyme. The high thermostability (Tm = 87oC) of CYP175A1 has the advantage to engineer this protein to create an artificial thermostable enzyme. We have studied the peroxidase activities of L80H and L80Q mutants of the enzyme at different temperatures and pH to determine the optimum conditions and results were compared with those of the archetype peroxidase, HRP. The substitution of the leucine with histidine or glutamine was indeed found to enhance the peroxidase activity of CYP175A1, which is more prominent at high temperature. For further information, visit our lab website.